For those confused by a Twitter message/contest just sent out by RadioCityLOTR (which is not me! ): Howard Shore is not conducting the Radio City concerts, nor "performing" at the event per se. 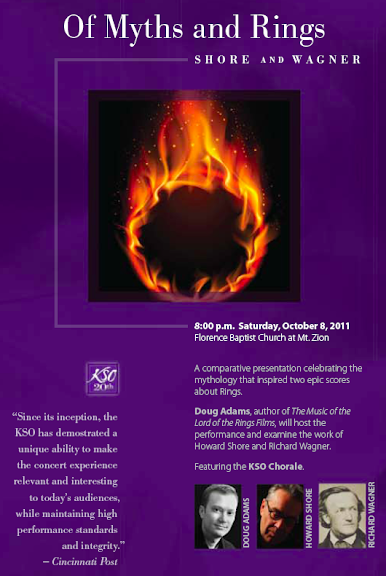 As has always been the case, Maestro Ludwig Wicki will be conducting. Howard will be in attendance, and will speak publicly, but those expecting him to burst into song will be sorely disappointed. If you didn't get the Twitter, or weren't confused -- move along, nothing to see here! Nothing too new here for blog readers, but Howard Shore/The Hobbit news is always worth mentioning, yes? Andrea and Robert from www.badtaste.it send this in: Hi, just wanted to tell you we met Howard Shore during a public speech yesterday in Rome, before a Lord of the Rings Symphony performance at Auditorium Parco della Musica. He answered a few questions about The Hobbit: he’s composing music for the movies, and he said that as we all know, there’s a new director, but Guillermo Del Toro wants people feel these movies are part of the trilogy. So, especially when you’ll see the second Hobbit movie, you are going to feel a strong continuity with the Fellowship of the Ring - even musically. Obviously, there will be new compositions and a lot of different things, but they are going to establish a strong connection between the movies, thanks to characters like Bilbo and the Dwarves. See TORN's original report here. Thanks so much to Roberto Di Benedetto for sending in this thoughtful review! It is one of the best places on earth where to listen to live music, everything is in wood with special wood pillows on the ceiling which give the best sound as possible. I really could feel the music and the vibes going through my body and I was so overwhelmed because that was the music I dreamed about for so many years. Then the Shire and then the shortcut to mushrooms and then Weathertop and black rider, Rivendell and so on.. wow! Strong men voices and the bright women ones with drums, strings and trumpets!!! End of part one the audience exploded, loooong applause and a standing ovation! I thought: ok so what are we going to do at the end of the show? Bring the theater down?? Second part started with the wonderful notes of the beginning of The Two Towers, the scene through the snowy mountain tops. That is one of my favorite parts and sadly I was disappointed because they skipped the fighting Gandalf/Balrog… anyway I was soon satisfied with all the Gollum, Rohan, Evenstar, Ent march, Isengard unleashed, the Ring theme, the return of Gandalf, Shadowfax, forth Eorlingans!… The Return of the King section was definitely the most pompous and stately with the Lighting of the Beacons, Gondor siege, Mount Doom and I was dying to listen to the destruction of the Ring with the contrast of the huge orchestra and chorus unleashed and then suddenly the voice of the soprano Ann De Renais! AMAZING! My body was so tense I felt like Sam! Reeeaaaachhh! And then the Eagles that was the best moment of the two hours. That piece of music is for me real poetry: sadness but also “glad to be with you”, death but also life, despair but also hope. I have to say that the soprano knew the words perfectly, she must have studied a bit of Elvish. She also sang “Gollum’s song” and “Into the West” and she was fantastic even though the voices of Emiliana Torrini and Annie are untouchable, the soprano gives to the song a different cut, you know this better than me. Ok so lights up and 15 minutes applause and standing ovation. 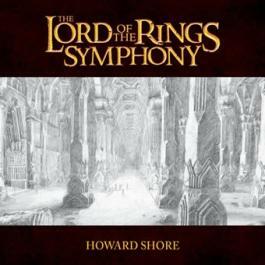 Howard Shore was so moved, he gave us so much energy and now he was taking back some from ours. So polite to highlight the other artists on stage from the soprano to the first violinist, the chorus conductor, the little girl that sang some parts of Ben Del Maestro. After the concert there has been the chance to meet the Maestro and get an autograph on the CDs. I brought my three booklets of the Complete recordings. Staff said he would have signed only one CD per person and I had three :). When I had my chance to be in front of him he kindly signed the three booklets and said “don’t tell them!” with a big smile. He was very tired but always kind a polite with everyone. I hope there will be a chance to have him in Italy again maybe with his other symphonies (the single movies ones). I would definitely go again even with my 4 hours driving to get to Rome! Best of luck to Maurizio and all involved. Remember to keep us in the loop with reviews! 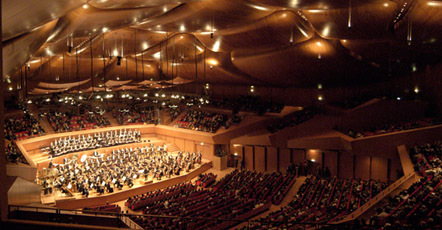 On Thursday, June 25 the Munich Radio Orchestra will be performing a concert of music produced locally to kick off the 2009 Munich Film Festival. Among the programmed works is a suite from Shore's Silence of the Lambs. Interested? Click here for more information. Thanks to Georg for the heads-up! I rather hate this kind of proofing; it's such a negative process. Why is it that blanket statements work so well for praise, but only meticulous complaints work for criticism? And why are there such inequities in the weights? "I love what you've done here, this is beautiful! Can we please address these 12 things I don't like?" Which half of that statement makes the most impact? I'm certain I'm being overly sensitive. These guys are pros, they know the process far better than I do. The publishers have put together an amazingly beautiful piece, I quite assure you! Polishing takes time and causes headaches, but such is the way of these projects. We're so amazingly close to a finished product now, it feels absolutely surreal. This book has always been a concept... a file sitting on a hard drive... a stack of curly edged pages, over-saturated with cheap printer ink. It is bizarre to hold something in my hands and realize this is just one or two steps away from being an actual book, not simply a book-to-be. It's also a bit nerve-wracking, and I fully admit that the pressure has been high in the past week. I'm sure I've passed some of that nervous energy on to my team, and I can't thank them enough for their tolerance, their hard work, and their Wizard-like attention to detail! For now, we're back in the Hurry Up and Wait holding pattern. I expect that we'll see another draft within a week or so, at which point we'll all turn back to our punch lists, check to see what's been addressed, and then comb through everything all over again. Thankfully, this process should be considerably more streamlined the second time through! But make no mistake, we'll be just as diligent and unforgiving as before. Check this post often for updates. The world is spinning quickly right now, so everything is ending up in the same place. UPDATE 6/18: Just realized that my desktop calendar is still on March 2009. That tells you something about this spring! UPDATE #2 6/17: All copy edit notes are in. Now compiling while simultaneously sorting through new graphics. Planning to deliver all to publishers tomorrow. Speaking of which, expect the publisher to be publicly announced within days... possibly early next week! I'll start digging through emails tomorrow. Apologies to those who haven't heard from me yet! UPDATE 6/17: I have an ISBN number! ...I think. UPDATE 6/16: Waiting on a late-night review session. Feels wonderful to put my feet up for a little bit! The rain on the windows is beautiful today. UPDATE #2 6/14: Requesting one last David Salo favor. Hope he has time! UPDATE 6/14: Switching to top-posting by request. My car was just rear-ended by some hapless teenager. I told him just to forget about it... I need to be at home proofing. No time for such material niceties! :) And hey, the story of finishing this book just gained a lovely dramatic embellishment, so that's always a plus. UPDATE #2 6/12: Lawyers and contracts and books, oh my. It's funny, I've been saying for the better part of a year that I've felt like the last guy in left Middle-earth waiting to turn the lights out after the grand LOTR phenomenon. But now I realize I've actually been a caretaker, watching over Tolkien's beautiful world until everyone moves back in. I can hear them knocking now; Middle-earth is about to see a rapid population increase. Thanks you all for the generous thoughts as I chug through this challenging spell. Everything is coming together beautiful. It's terrifyingly demanding work, but then it should be. Oh, and I don't want to claim that I'm the only one toiling away. I have the best team on earth working for me right now, and I can't thank them enough... and the team I'm working with on the Radio City is phenomenal. That's all about to explode soon! UPDATE #1 6/11: Writing my own release blurb! UPDATE: It's now 3 a.m. and I have a morning meeting with David Salo, so I'm heading for bed. Heftier updates coming, I promise! If you haven't been to the Radio City LOTR site lately, it's time to re-click and refresh. The site's new audio into features a radio spot voiced by none other than Gandalf himself, Sir Ian McKellen. This was our mystery recording session from a few weeks back. As I've mentioned in the Ongoing Discussion, this was a particularly exciting day for me. Through the immense generosity of the powers that be, I was allowed to write this spot, and thus enjoy the overwhelming thrill of hearing Sir Ian give voice to my words! Come share in the power, indeed! UPDATE: Hope you enjoyed the preview--the taste of things to come, as it were. Sir Ian will be back soon... along with the new Radio City LOTR site! This is just the first of the press coverage to come, and I'm extremely happy to see it coming from our old stalwart Film Score Monthly. Wasn't I just musing on the start of spring? How did it come to be that the summer solstice will officially begin later this month? I suppose a combination of airplanes, appearances, deals and deadlines can cause one to lose a few hours here and there, eh? Nevertheless, I'll try to give you an overview update on the latest goings-on ongoing... and there's plenty to digest. Radio City is now coming together in a very big way. I know we've not had many announcements on that front lately, but behind the scenes, gears are turning. Many people I've spoken with are waiting on the schedule/travel accommodations before purchasing tickets. Although nothing's yet announced, I think it's fair to say that you can expect to see the side events lasting throughout the weekend. We'll likely have the first events on Friday, October 9, though I'm not yet sure if things will kick of before or after the opening concert. And it's entirely possible that the book release will be the first fête of the weekend! I presume I don't have to tell you how exciting that is to me. I'm also told that the hotel partnership should be solidified and announced very soon. Airfare is low at the moment, and likely to climb soon, so you may want to take the airfare plunge now, then book your room later. We've lined up a very impressive NY night spot for some of the after hours events, and the list of celebrity guests continues to grow. I wish I could say more, but I can't yet. I also shouldn't mention that, if you search YouTube, you'll find many more videos like the above, so I'll be quite certain to avoid saying that... And yes, this shows the now-infamous intro where the picture kicked in a few seconds late. As I noted in one of the comment threads last week, it's nothing short of a minor miracle that this concert came off at all. 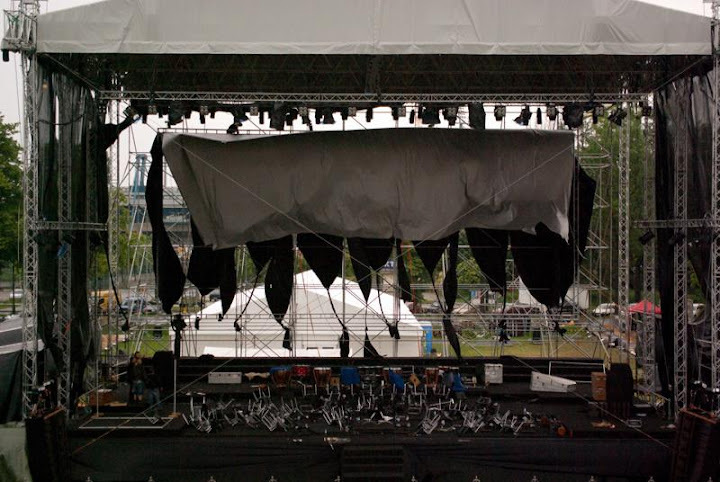 A severe storm the night before completely destroyed the projection screen -- one of only two in Poland, I'm told. See the picture below. It looks like the Ringwraiths had their way with it! So in less that 24 hours, the second screen was located, shipped and installed in time for Saturday night's concert. That there weren't more technical mishaps is testament to the incredibly hardworking multinational team that put this performance together. I hope that any sleep lost was made up tenfold the following day. It was more than earned. Incidentally, I had coffee with the festival director the morning after the performance, and he seem absolutely drained. Thrilled and proud, but drained! Right now, I need to get back to work selecting audio examples for the forthcoming full Radio City website, so I must check out for the evening. 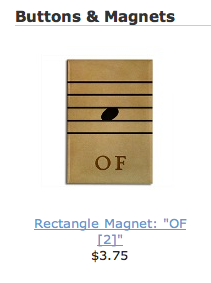 Ah but first, please note that our new magnet is now available... the second and final "OF" of the project. Wow, only three more to go! Click here, if you're interested.